My aunt and uncle picked up this traditional embroidered wall hanging while visiting the Emir’s Summer Palace in Bukhara, Uzbekistan. It’s called a suzani. 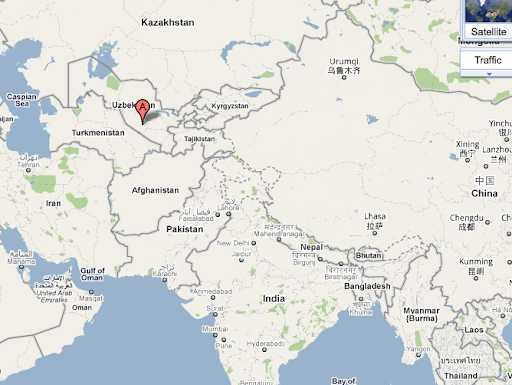 Below is a map with Bukhara, Uzebkistan marked (I was a little vague on exactly where Uzbekistan is myself). My aunt and uncle told me it was one of their more memorable vacations, and they’ve been on some really memorable vacations. It’s now on my list of places to visit someday. Fortunately for us, Mary Corbet has written a whole post about Bukhara couching, plus a video tutorial. Personally, I’m thinking hard about how to incorporate some Bukhara couching into my current embroidery pieces. It’s really lovely. Something interesting about this particular wall hanging: there are a couple of spots where the embroiderer seems to have run out of thread halfway through a motif and switched colors. Flowering vine motifs are very common in suzanis. For additional reading on history and common motifs in suzanis, you can check out the article Splendid Suzanis by Caroline Stone. Now, I took a ton of photos of the suzani. It’s absolutely gorgeous in person. In hopes of conveying at least some of its beauty, I’m going to finish the post with a pile of extra photos. This entry was posted in Embroidery around the world and tagged bukhara, embroidery, suzani, uzbekistan. Bookmark the permalink. I’ve seen that random switch of colour, as though the embroiderer ran out of thread, in a few other pieces, mostly what academics refer to as “Folk Embroidery” – in which case they probably did, quite genuinely, run out of thread of the right colour!